During the internship process of Razorpay, our task was to research and work on a new feature of polling in WhatsApp groups, enabling the user to ask questions and get responses from other members of the group. WhatsApp being a global application with around 1 billion users, I just wanted to confirm the user types and major audience it supports and major use cases. 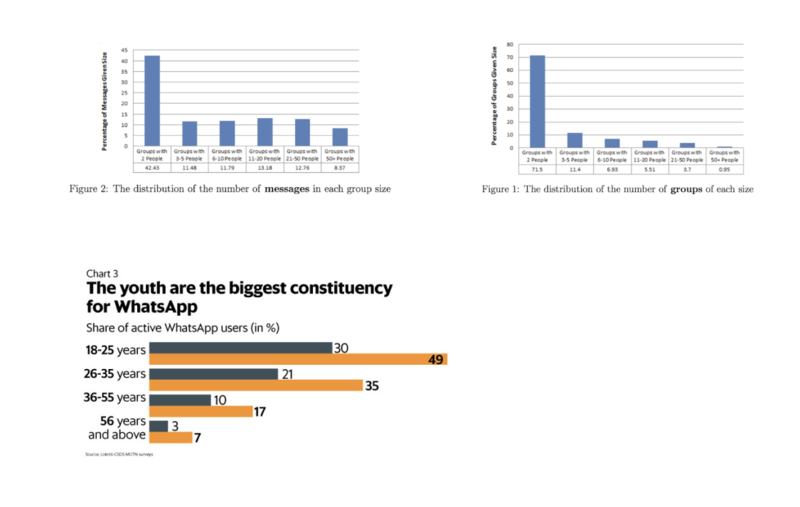 WhatsApp’s social network is unique in several ways relative to other social networks. This application was developed to allow users to privately and freely send messages to each other through their smartphones. Majority of user lie between age 18-25 years and the other major age group is 26-35 years. WhatsApp has provided a free alternative to SMS (Short Message Services) which is often 3 still a metered (pay per use) service. Not only is WhatsApp often more cost-effective than SMS, but it facilitates large group conversations, something that is difficult through SMS, if not impossible. As the majority of our users are from 18-25 years and 26-35 years, I decided to interview a few people to get a better insight into the scenarios in which poll might be used. Before taking Interview I noted down the things I need to know and things I need to verify. What does people prefer on whatsapp professional or personal work on WhatsApp? 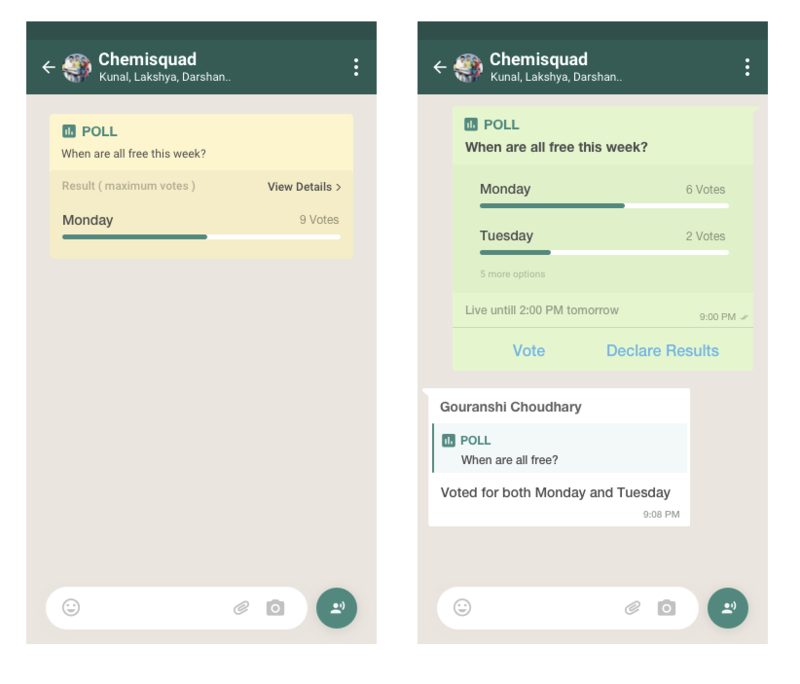 What are the user’s incentives to create a poll on WhatsApp? Are users familiar with polls feature on any other medium? What kind of questions people might ask on the poll? Which app did they use the most for messaging daily? For what purpose you use WhatsApp, professional(work) or personal? What are the top active groups in your WhatsApp? Have you ever used the poll feature in messenger or facebook? What question did you ask or answer? Most of my friends are from IIT's and gave almost the same answer maybe as they all are from almost the same background and live in the same environment. So I took telephonic interview of 2 of my school friends of the similar age group to add some diversity. People prefer WhatsApp for personal use rather than professional. It was assumed that users who shifted from SMS to WhatsApp might be using WhatsApp for professional purpose but still, interviews suggest that they prefer WhatsApp mostly for personal usage and check office work only when required. Moreover, as there are specialized applications like slack and flock for professional work. Startups also prefer them over WhatsApp. Users working in government service sector might prefer delivering any command rather than spreading a poll and ask for everyone’s opinion ( In startups polls might be used, but that is not taken into account right now ). Surveys cannot be conducted via Whatsapp due to group limit moreover people don’t prefer professional work on WhatsApp. 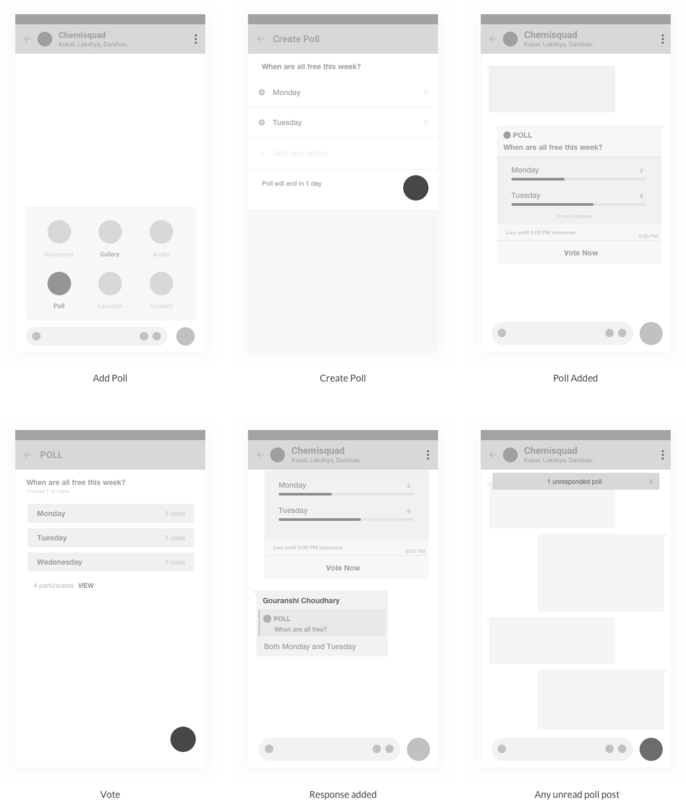 Goals and Tasks Uses whatsapp for gneral messaging with friends, family and also uses it for communication in several groups. Would like to spread a small poll in groups pan some event or to get a quick opinion of friends or family on any topic. 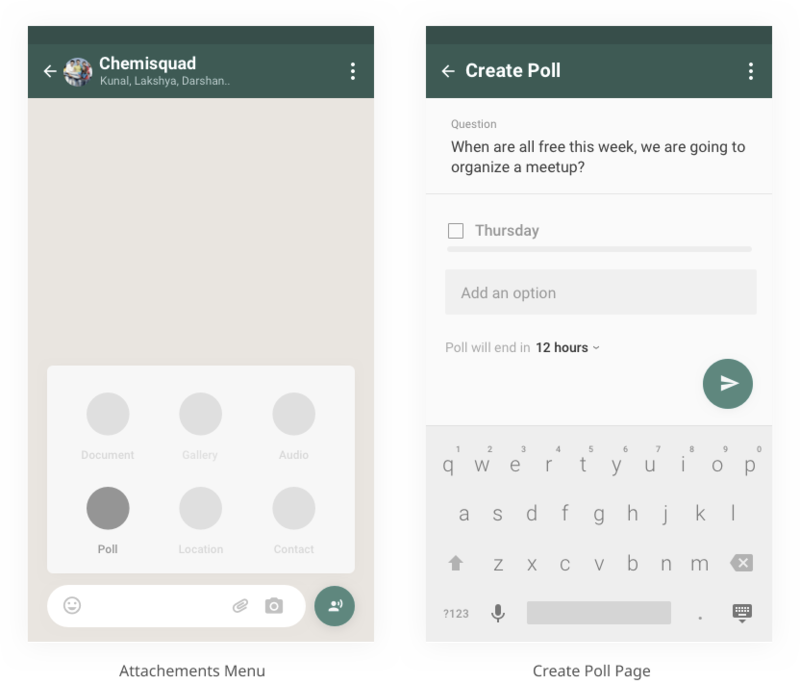 WhatsApp already has many attachment options available, Poll is also a kind of attachment and an addition to the attachment feature so grouped it with rest of the attachments. In the 1st iteration, I decided to keep a horizontal full-width banner on top which shows that some Poll is live. Later I came realized that the chat area is already bare minimum after opening the keyboard ( which is open most of the time while chatting ) and adding a banner to it will leave no space for messages. 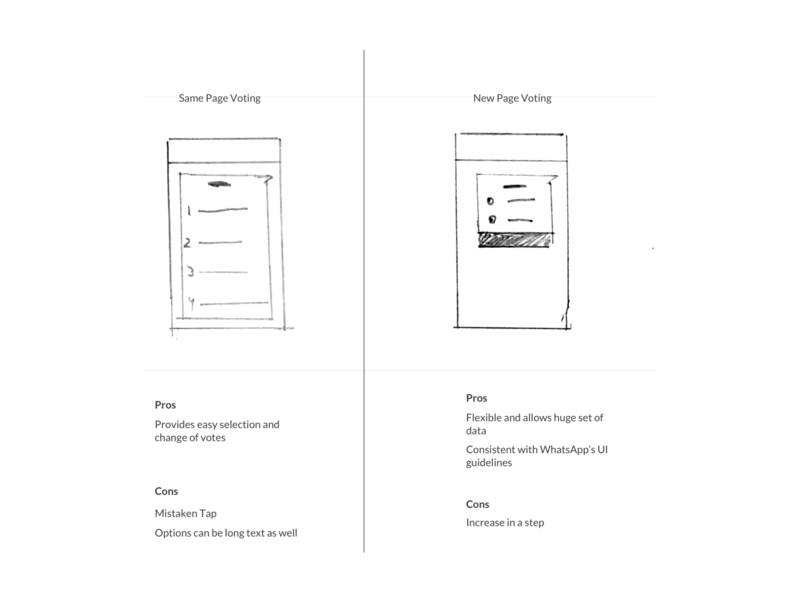 I iterated the idea and took inspiration from Slack. Decided to keep the banner only when the poll is unresponded. 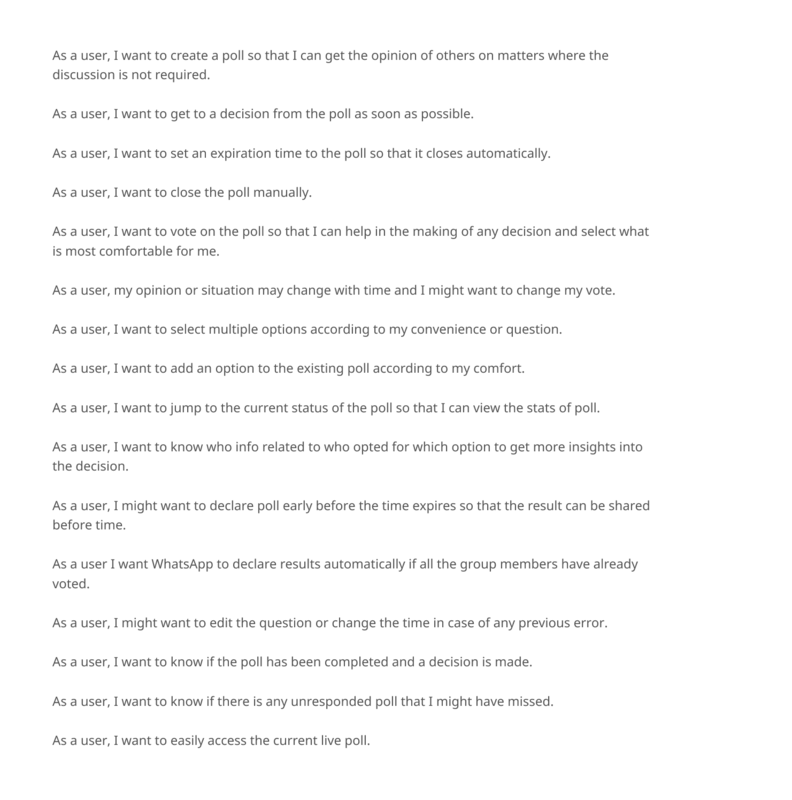 Modals lead to disturbance while creating a poll, moreover creating poll requires 2-3 minimum inputs by the user. The new page is a better option here knowing that WhatsApp does not use modals and overlays anywhere in attachments, so using a new page will also remain consistent with the rest of the application. The new view provides much more flexibility in terms of options and data entry. Large data sets can also be included in the new view. Prevents faulty touch or any mistaken vote. Users can access poll directly from group detail page and if the poll is not yet responded they can access it directly from the chat. The user can also view previous polls and their results. This will also help in getting the results quicker and make sure that everyone is aware of the poll. 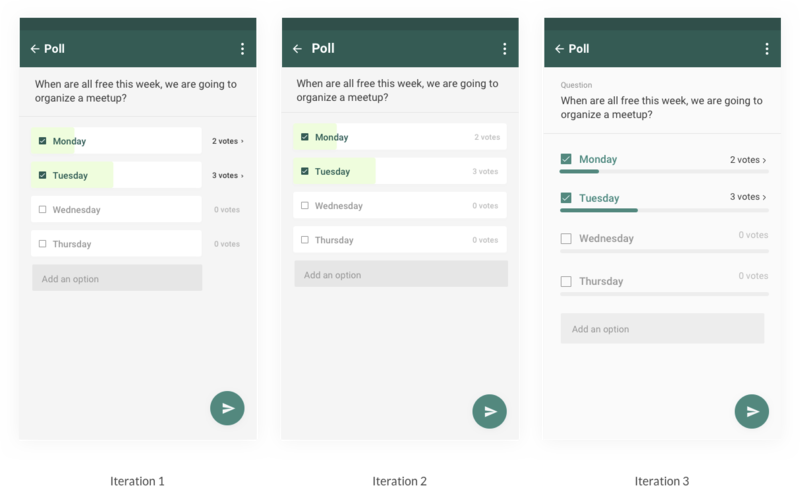 Polls feature is accessible from attachements icon, where all other attachments are present. Users can also select the end Poll duration ( not exact time ). Knowing that most of the polls are not going to be professional or surveys, the duration is selected than the exact date. The floating button is used for the forward action as per WhatsApp UI. The user can view the top two options, time left, the total number of options and can vote from the next screen. The user can also view the status of the poll real time and check who opted for with option and the person who created the poll can declare results and close the poll anytime. The result will be declared after every person in the group has voted or the time has expired. Inconsistent UI with rest of the application. 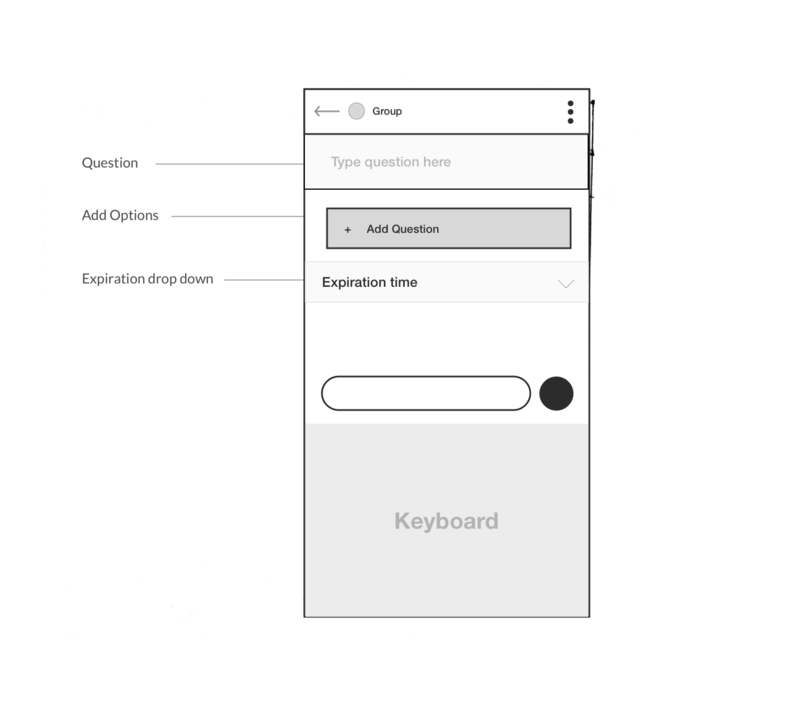 In case of heavy text polls this UI might not function properly moreover the number of votes doesn't feels to be clickable as turned out from usability testing. Used line instead of a card to support huge data. The user can do multiple voting and can even view people who have participated. As by our assumption, most of the users use WhatsApp for personal use, where the poll will be mainly used for day to day activities so hiding results here is not a good option. Users might want to know what others are comfortable with and then decide. So real-time results will be shown and the results will also be declared once the time expires or the person who posted the poll declares the result. 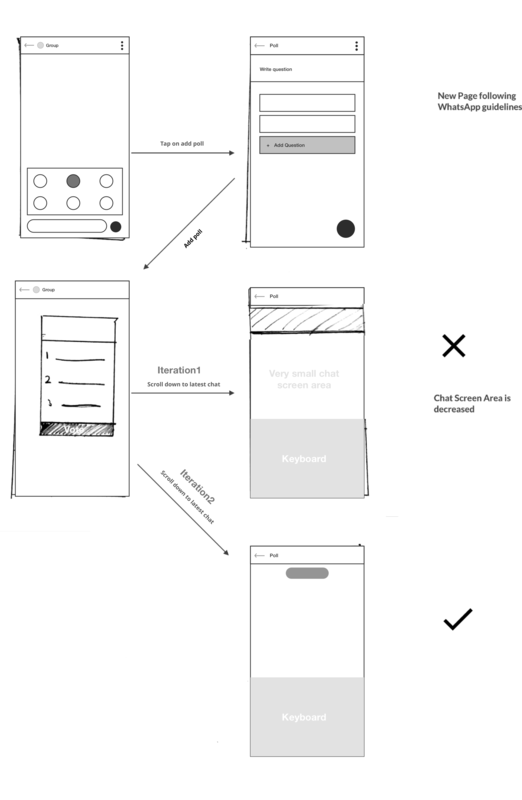 Due to the time constraint, I worked on the main flow, here are a few more things which can be implemented. All the assumptions made can be tested and iterated accordingly. To increase the poll response rate and to get the result properly on time, nudges or notifications can be used.